I threw over the top in High School. My coach at LSU Skip Bertman, after my first couple appearances suggested I drop down. It was more down to a lower 3/4. Kept getting stronger and stronger from there. Just had the two pitches from there which you can get away with in pro ball. Both pitches were hard- fastball/slider. In pro ball I had hurt my backside, tore a muscle in my back and it hurt to throw from anywhere. Started fooling around with different arm slots. I also started to throw a splitter. It’s a pitch that I had success with. It was a different pitch for me, gave me a third pitch that I needed in pro ball. I never had any arm problems which I believe was because of my arm angle. Mixing up my arm angles gave me an advantage in that the hitter never did see the same arm slot twice in a row. I never did really have one set arm slot. I tended to be effectively wild but was efficient if that makes sense. It’s ok in college but in pro ball they tended to frown about it. Looking BB/P IP etc would be high. I would be the guy who get 3 outs in an inning on 12 pitches but had a walk and a hit in the inning. No I don’t think so. Over the top my breaking ball wasn’t very effective. I was able to have 3 pitches that I was able to throw with the same mentality, same arm speed. I never threw a changeup. Guess like most pitchers that drop down, it is out of necessity. Like anything, be that your golf swing etc, you need to perfect it. Try dropping down once in awhile and see what it does. Try fooling around with different grips and see what the ball does for you. There is nothing wrong with mixing up your arm angles. If things aren’t working out for you on the mound then it’s time to change it up. Times I was getting too much movement with my 2 seam, I would have to switch to a 4 seam. Baseball you are trying to perfect an inadequate science. Stay as closed as you can. To opposite side hitters, you are going to expose the ball longer to the hitter, so trying to keep that front side closed off to them. For the breaking ball it’s important to keep the fingers behind the baseball. Also don’t forget about your stride, it still needs to get out there, as long as you can get it. I was big into the mental side of the game. Would picture myself pitching over and over again in my mind, feeling where my arm slot was. Fastball, slider and splitter - I was most effective at 90-92, spring 1992, got up to 95 which was cool to see my arm strength but it would flatten out and have less movement. With the movement I was able to get, I was fortunate to be able to throw the same to both side hitters. A lot of times I would just let my fastball do it’s thing. Start it down the middle and let it run inside to the righty. The splitter was effective to lefties, basically would act as a changeup for me and be down in the zone to them. I would throw my splitter in a lot of fastball counts. I was always unpredictable on the mound. Never had same arm slot twice in a row. Guess I was always a happy-go lucky guy on the team but my teammates knew I worked quick and threw strikes. It was fun for me to go out and get my job done in 12 or less pitches in an inning. 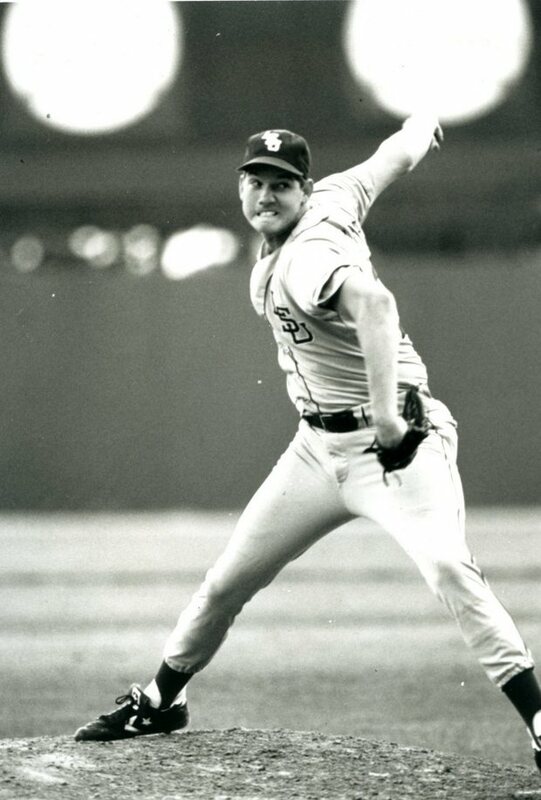 1997 I threw 30 scoreless innings in a row, that is always fun!